1335MABINI proudly presents Dexter Sy in a solo exhibition titled “Identity Crisis” from the 15th of August until the 11th of September 2015. 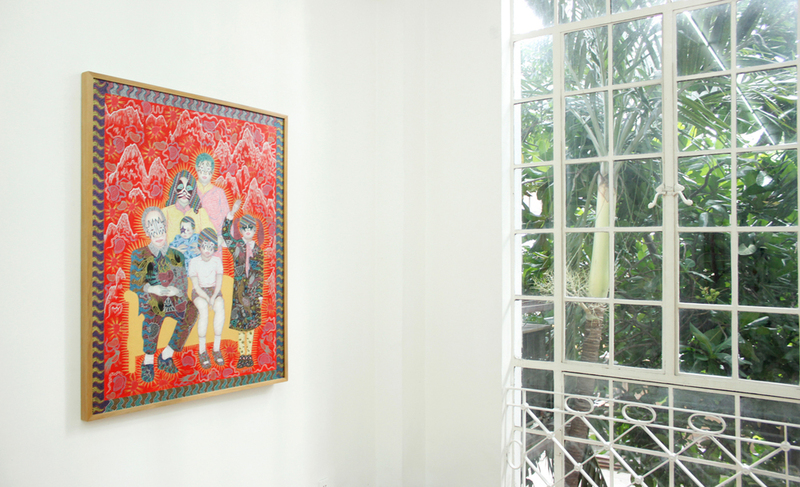 With his trademark ornate aesthetic, Dexter Sy continues to articulate the flux of identity in cross-cultural milieu. Being Filipino and Chinese in lineage, Sy effortlessly illustrates the apparent yet accepted dysfunction arising from a diverse heritage in satirical fashion. His witty critique has been amplified further by his decision to meld imagery at an early stage of his career with his more current choice of human representations. The juxtaposition and overlay of courteously-drawn provocative iconography with domestic portraits, intensified by the use of vibrant hues, comically emphasizes the incongruity of clinging to static notions of identity in the 21st century. This fundamental shift is discerningly articulated by Dexter Sy in his installation work titled “DNA.” Braiding together numerous “Good Morning” hand towels and textiles patterned with Filipino indigenous motifs, Sy perfectly conveys the transmutation of present-day civilization. Constructing a durable identity that coheres over time and space becomes increasingly impossibleiv, and to unravel the composite fabric of contemporary society for the purpose of “authenticating” identity is pointless at best.